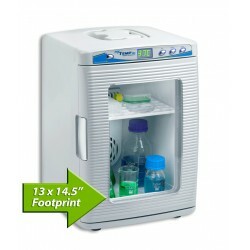 Incubators There are 4 products. Precision temperature control up to 75°C. 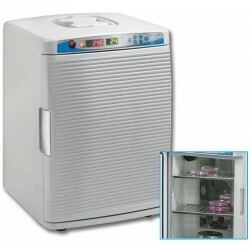 Dual-Convection technology, excellent uniformity and recovery. Includes SureCheck™ temperature logger and software. Stainless steel chamber with internal power outlet. Digital temperature control. Personal sized, 13 x 14.5" footprint (20L). Accepts bottles and flasks up to 2L. Two models: Heat Only or Heat/Cool. Internal outlet, for installation of shaker, rockers, etc. Digital control of temperature and CO2. Personal sized, 13 x 14.5" footprint (20L). Accepts bottles and flasks up to 2L. Includes 2 stainless steel shelves. Dual beam, infrared sensor. Heat - Shake - CO2. 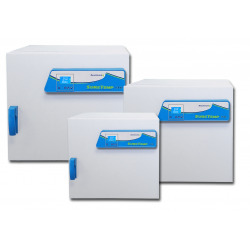 Six side heating provides excellent uniformity and recovery. 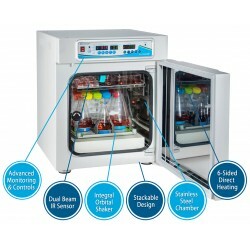 Integral MAGic Clamp shaker, ideal for suspension cell culture. Precise monitoring over CO2 with dual beam IR sensor.